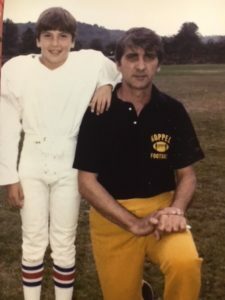 During Coach Bruno’s tenure at Beaver Falls it was understood that any young man who played football for Coach Tony Esoldo in the Koppel Midget Program was well equipped to step in to the Beaver Falls football program. Tony was the first head coach of the Koppel Panther Midget Football Program, a position he held for 3 decades. Tony excelled at both baseball and football at Ellwood City’s Lincoln High School. After graduating in 1955 he continued his baseball career with the United States Army Colonels and traveled throughout Europe playing ball and serving his country, before returning to Koppel. During his time as a head coach he led his teams to 4 division titles, 2 Beaver County Pop Warner Championships and the Pop Warner National Championship in 1969. His coaching record was so impressive that he was recognized by the PA House of Representatives for his outstanding coaching achievements and his immeasurable contributions to the welfare of the community at large. Tony owned and operated the Corner Tavern in West Mayfield for 40 years during which he continued to give back to the community by sponsoring and supporting baseball from Farm League to Legion. He also supported the Football Boosters in West Mayfield, Beaver Falls and Blackhawk. Coach Esoldo always reached out to the young who was too small or couldn’t make the other midget teams or couldn’t get a ride to practice; he made them all become winners. Tony passed away earlier this year. He was predeceased by his daughter Renea and is survived by his wife Darlene and their son and four daughters.